From 7 in the morning cars with noisy sirens drive along continuously and half an hour later our neighbour discovers that his battery is empty and wants to have it recharged as soon as possible. Therefore he hits the gas pedal to the bottom after someone has helped him with to start the car. A nice country, Italy, but very much noise everywhere! We leave early since we are awake anyway and first drive to Montecassino, a large abbey which was destroyed in the second world war since it had become headquarters for the Germans. The building has been totally rebuild, but we don't find any charm in it. The view from the mountain is much better, despite the low hanging clouds and the haziness. To avoid the busy roads we take a turn into a narrow lane and soon we find ourselves in a quiet valley, but the road becomes worse and worse. The holes are sometimes 20 centimeters deep and they are all over the road. 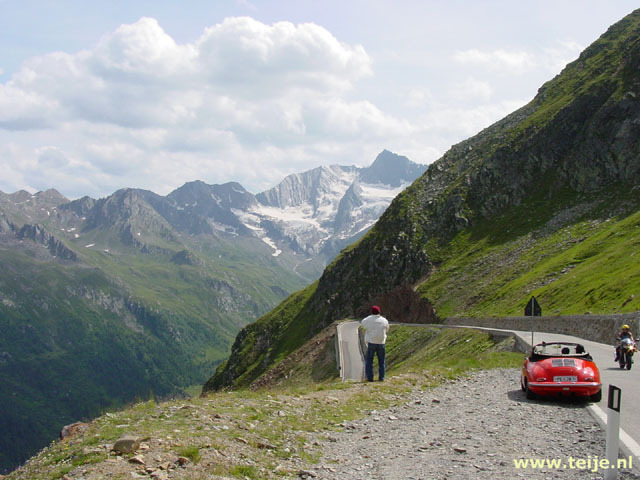 Near a lime quarry we stop for a picknick, and we experience the most silent moment until now in Italy. Only a few birds can be heard and there are cars on the road. No wonder that nobody bothers about the condition of the road when nobody lives or drives along here. But there are a few very scenic villages in the area, many of them build closely together on the top of a hill. And we see more and more olive tree gardens. This region still belongs to Abruzzi, a capricious and mountainous area, quite different than the cities and towns we have seen the last few days and much more pleasant since it is not so busy. Finally we arrive somewhere near Isernia to a main road and come across this abbey, the Sant dell Addolorata. When we come closer we find out that it is quite a large abbey and is situated very nicely against the green mountainside. Then we are out of luck, again; or maybe not, since we get the flat tire again near a parking place and we have the spare tire quickly installed. It is friday at 4 in the afternoon but in a nearby town we are glad to find an open garage. Within 15 minutes we are on the road again, but it is still quite a fuss: first emptying the back of the car to get the spare, all our luggage on the road, getting dirty hands, packing up the car again and repeating this again at the garage. And again it is the valve that was leaking, now on the left front side (a few days ago it was on the right side). We had just bought these tires new before our holiday... Anyway, we are glad we had both times a parking place near. It must be terrible to get a flat tire in a tunnel! The route to Pompei turns out to be a bit more difficult than we have expected. On the map it looks quite easy, but now we come from the south and most people probably come from the north. We guess that on the northern side the signposting is much better than on the road that we take, coming from Salerno! We drive along with the flow, that is to say we drive 110 km. an hour where 80 km. is allowed because of roadworks. In general, Italians seem to drive about 30 km too fast, no matter what the speed limit is, except on the highways where 130 km. is allowed). 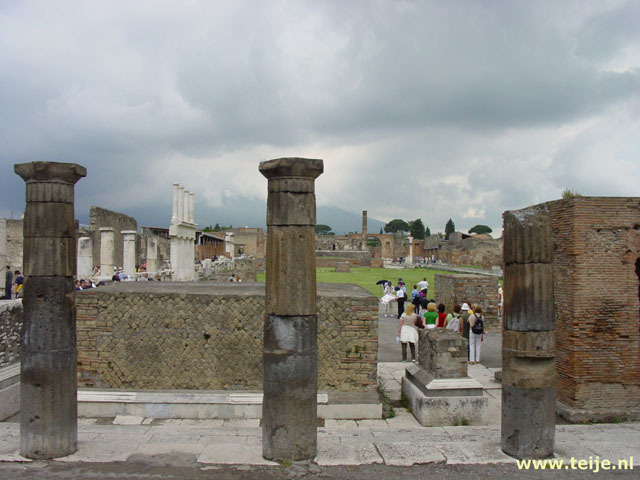 At Pompei we don't take the first turn since our intuition tells us to take the next one. And we are right, we take the second turn, have to hit the brakes hard since the exit road is only a few meters long and within a few seconds we are on a square before the ruins of Pompei. Although it is very busy on the square, the campsite still has plenty of space. We find a nice spot to put our tent but first we go onto the square for a beer and a coffee. Especially the last hundred kilometers have been very tiring. From our tent it is only a 100 meters walk to the entrance of the fossilised town, we have never expected we would be able to stay so close to it. From the outside we can see the original Roman walls and some of the houses but tomorrow we will have a whole they to explore this town. We are very excited to visit it, especially since we have both read an impressive book about the place in the last days ("Dag der gramschap", translated that is "Day of wrath" written by the Dutch author Bertus Aafjes). Elisabeth sometimes complains that there are too many pictures with her on it, on the website. The reason is that I usually have the digital camera and we can put those immediately on the site. Therefore she is more often the victim than I, especially in situations like this when she has a fit of laughter. Ok, we promise, before long we will also place a picture of a roaring Teije on the website!